Denimology has teamed up with Parker Smith this September to give away two pairs of perfectly fitting jeans – up to a $400 retail value (average retail $178 each). 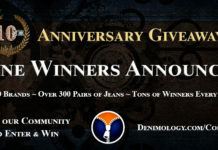 When you enter the giveaway, you will also receive Denimology’s and Parker Smith’s weekly newsletters on the latest styles, denim trends and special offers. PLUS you’ll also receive a promo code good for $25 off any purchase on your next order on parkersmith.com just for entering. This giveaway ends at 11:59 PDT (-0700 UTC) on September 17th. Please don’t forget to follow Parker Smith @parkersmithjeans to get the latest on their perfectly fitting jeans!